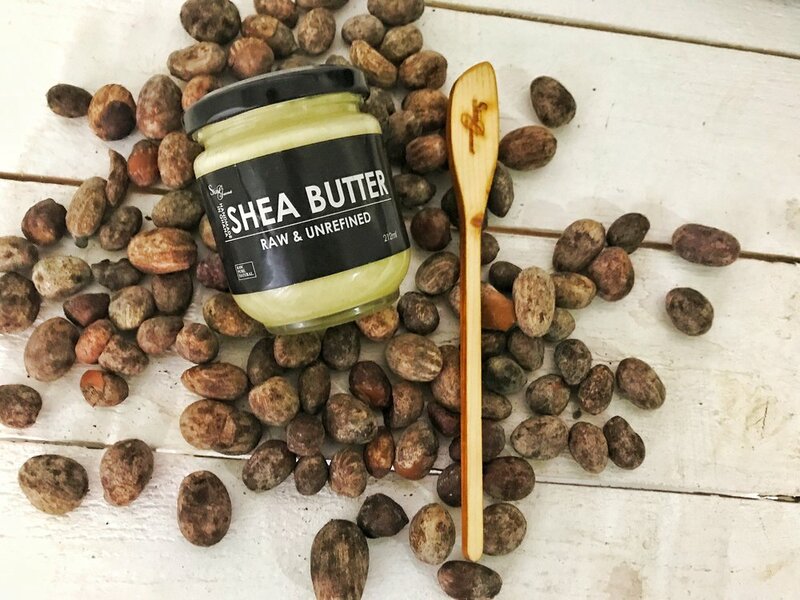 Our Shea Butter is FOOD grade! Yes! That's right! Did you know that in Northern Ghana Shea Butter is used as skincare and food? The Philosophy is Ghanaian - If it is good enough to eat, then it is good enough to put on your skin. Feed your skin like you feed your insides because what you put on your skin will end up in your body and what you ingest will show on your skin! #EATYOURSKINCARE ! Plus, just like other skin-loving sources of healthy fatty acids — such as raw shea butter or coconut oil — cocoa butter is great for naturally healing dry, sensitive skin. Real cocoa butter is completely edible like ours (and has a faint taste and smell similar to dark chocolate), plus it’s also used very often in skin lotions, lip glosses, chapsticks and other beauty ointments. Cocoa beans are a high-antioxidant food, since they contains a significant amount of polyphenol and flavanoid antioxidants. In fact, cocoa beans themselves have been shown to be one of the greatest suppliers of polyphenols in our diets. Some of these antioxidants remain in cocoa butter even after it’s separated from the beans’ solids, which means it’s beneficial for improving immunity, lowering inflammation and improving heart health — all despite the fact it is a once-feared saturated fat. 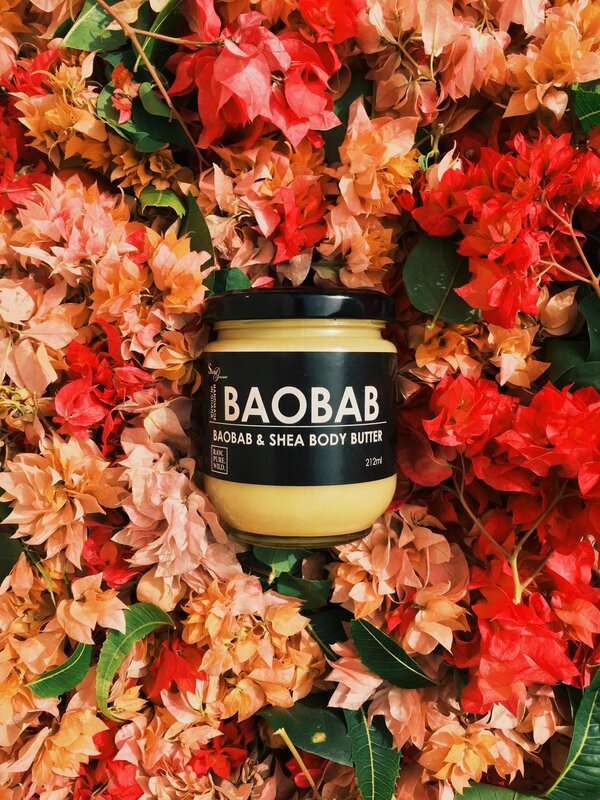 Our Baobab & Shea Body Butter is Skin Gourmet's flagship product. It was our very first product that we started this company with! The butter is a very simple formulation of Raw & Unrefined Shea Butter, Wild Northern Honey, Cold Pressed Coconut, Moringa & Baobab Oil and Vitamin E. This butter is one of the creamiest and rawest butters you will every experience. It contains absolutely no preservatives, emulsifiers, fragrances or anything the super sensitive skin cannot stand. This cream does not lighten nor darken but rather gives you a flawlessly even skin tone. It is great for healing the skin and for fighting against aging. Another thing this cream is great for? Say good bye to ashy feet! Use our Body butter in the morning and we guarantee you that by evening your feet will still be well moisturized. This butter will save your feet from embarrassing dry cracked feet. Our gourmet butter is also excellent for the hair and for conditioning the scalp. This is the only butter you will need that can cater to all of your skin, hair and body's needs. Always insist on a free Gourmet Preserving Spoon when purchasing as we do not recommend using this products with your fingers. The spoon will increase the shelf life of the product.